So, in order to calm my nerves, I'm going to write about it. Jeremy keeps saying, "this is what you've always wanted." And it is. It is still what I want. But life changes can be scary. And that's ok too. Even when it is something we want. Just like, I wanted to marry Jeremy. But it was scary and I sobbed for a good 20 minutes after we left the reception. Not just sweet little tears about leaving my family and going off with this man I'd never lived with, but sobbed the big ugly cry. In a dress that had a corset type waist so that made breathing even harder. Jeremy had no idea what to do with me. He still doesn't know what to do with me. Obviously. Anyway, milking. 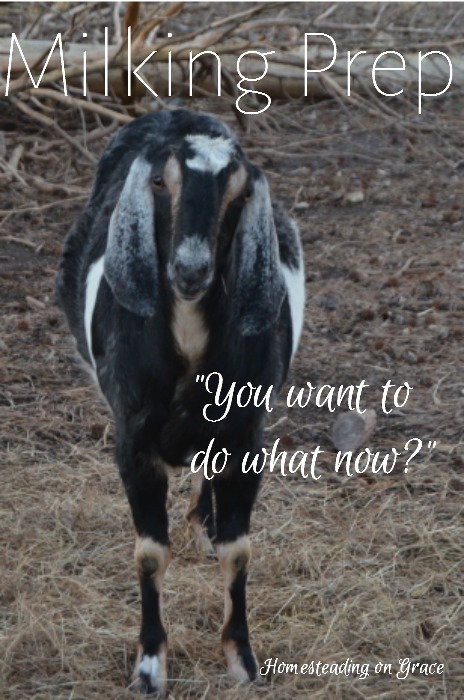 So to prepare for milking a couple of goats, the first thing I need to do is figure out what all I'm going to do with the milk. make yogurt, cheese, sour cream, cream cheese, etc. This is the part that makes me very nervous. Because we've never had goat milk. We've never even had raw milk. WHAT IF WE DON'T LIKE IT?? Ok, calm down, calm down. My mother-in-law had some raw goat milk recently and said it was very good. We'll deal with that when the time comes. But to prepare for drinking raw milk, I need to do a few things. First thing, I want to test the goats' blood for any diseases that could potentially pass through the milk to us. I don't want those diseases, and I want our raw milk to be as safe as possible. There is a reason milk is pasteurized these days, and it's because of all the nasty things that can happen to raw milk. Weed 'em and Reap has a couple of posts on how to do this. Her suggestion would cost around $100. I called my local farm vet to see what all they could do for me. They would cost a bit more, but would also test for TB. So I scheduled a visit with them to get the test going. This was, unfortunately, a bit late in the game, but better late than never, right? Hoegger Farmyard really helped convince me to go with the vet. So pasteurization kills off diseases that could pass through milk and also kills off germs and bacteria that could contaminate the milk out in the barn while you're collecting it. So if you aren't pasteurizing milk, you need to make sure to keep it clean. I've bought the EZ milker. (We actually asked for it for Christmas.) Don't make fun of me. I'm a recovering germophob and the thought of picking hay out of the milk I'm going to drink makes me want to buy some bleach. And drink it. So the EZ milker will keep the milk from being exposed to the air in the barn, which will make me a little easier to deal with. Now I still need something to keep the milk in. Apparently, goats have a wide range of their milk producing abilities, but from what I've read, I can expect more than a gallon a day from my two Nubians. This is good, because our family easily goes through 5 gallons a week now, and if we had free reign of milk it would be closer to 7. Or 8. The benefits of milking our own goats include avoiding the plastic milk jugs. The less plastic in my life the better. But glass is heavy, and can break when little children are handling it. So we'll need something easy to pour, and not too heavy. I found these Weck juice jars (being pretty helps) that will hold a liter, which is only a little more than a quart. I like them, though, and I've decided to buy one set of three of those and two sets of six of the half-gallon mason jars . So we'll have three liters of milk to drink from, and then half gallons of milk to do other things with, or pour into our juice jars for more milk. The last thing I can think of right now is a teat cup, and I have a brown coffee mug I'll use for that. Oh, and I'll need some teat cleaning supplies, which is just some warm water and some soap. According to Jenna from the Flip Flop Barnyard, we can use castile soap. She also has an udder balm recipe that is easy, I'll be putting that together this weekend. (I received a copy of this book set to review and advertise, and I'm an affiliate for it, just so you know. Actually, I asked to be an affiliate. Because it's that awesome.) It's The Nerdy Farm Wife's Natural Soap Making. I read through it the other night, and absolutely loved it. I can't wait to try my hand at making soap, Jan Berry makes it so clear, and covers all the potential problems and how to avoid them. And the set includes adding milk to the soaps, making shampoo bars, how to line the soap molds, and a handy soap-making checklist that I'm going to laminate at my Mom's house. For soap making, I'll need a few things that I can designate as only for soap. Working with lye scares me almost as much as drinking raw milk, so we'll just need to be very careful. The checklist I mentioned above includes a list of all the items I'll need. Some of the things, like a good solid spoon that won't react and an old crock pot (just for the pot), my Mom was able to find at a second-hand store. But I will also need a digital scale. I've used my trusty old mechanical scale for bread baking for years now, but measuring lye and soap things must be precise. I picked out this one . It's glass, so it shouldn't react if anything falls on it, plus it had great reviews. I also need an immersion blender , I picked out this one because, well, quite frankly my cart was getting a little expensive. We'll also need some things to mix the soap ingredients in, which again I'm hoping my Mom will find junking. It doesn't have to be nice stuff, just things that won't react with lye and won't break under extreme temperature changes. I'll also need gloves and goggles. And I'll need to send the kids to my Mom's house when I'm making soap. For yogurt and cheese making, I'll need a heavy bottom stainless steel pot which I have, muslin or cheesecloth, and some rennet. I want the muslin cloth because it'll be easier to wash and reuse. The one time I've used cheesecloth I had to throw it away afterward. So I think I'll just get a few yards of muslin, and cut them into several squares for my uses. 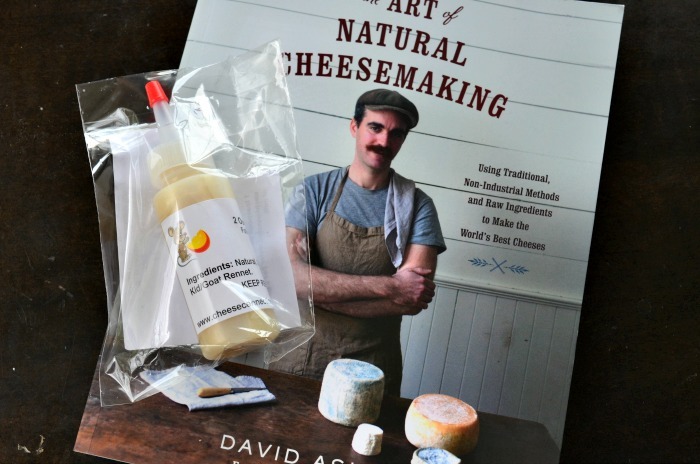 After reading Quin's review, I bought The Art of Natural Cheesemaking , and the Walcoren rennet . His method sounds right up my ally. Seeing all of this laid out does help me a little. I think I can, I think I can. Tell me, what am I forgetting? What else do I need? I love this. Way to go, girl! I was weirded out the first time I drank raw milk and ate an egg fresh from a chicken's bottom.....but I got over it. 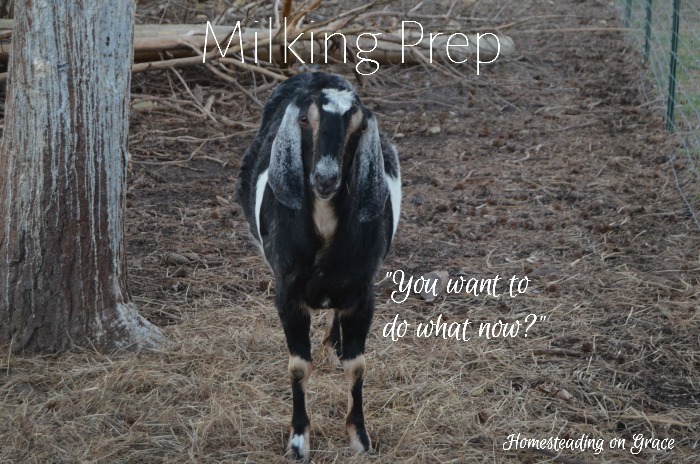 I'm hoping to get a milking animal someday, so I love your prep tips.